Yesterday, the world watched in open-mouthed horror as Notre Dame Cathedral, an 800-year-old monument in Paris, France, burst into flames. As the Paris fire department scrambled to save the priceless relics and artworks inside, French officials gradually started to take inventory of what had been recovered from the wreckage and what had been lost forever, with many — particularly Catholics, who had flocked to the city to celebrate Holy Week — gathering outside to sing hymns and mourn. Notre Dame acquired even more overtly nationalist symbolism following its renovation in the Nineteenth century by Eugène-Emmanuel Viollet-le-Duc, who is widely considered the godfather of modern historical architectural restoration. What it means to be “French,” however, has obviously changed a great deal over the past few centuries. While France is still predominantly Christian, the number of practicing Catholics has fallen year after year, from 64% in 2010 to 56% in 2012, according to one census figure. The number of Muslims in France is also growing, comprising more than 5% of the population (up from 3% in 2006) giving rise to rampant Islamophobia and the birth of far-right extremist parties like the National Front, headed by extremist Marine Le Pen. Although Macron and donors like Pinault have emphasized that the cathedral should be rebuilt as close to the original as possible, some architectural historians like Brigniani believe that would be complicated, given the many stages of the cathedral’s evolution. “The question becomes, which Notre Dame are you actually rebuilding?,” he says. Harwood, too, believes that it would be a mistake to try to recreate the edifice as it once stood, as LeDuc did more than 150 years ago. 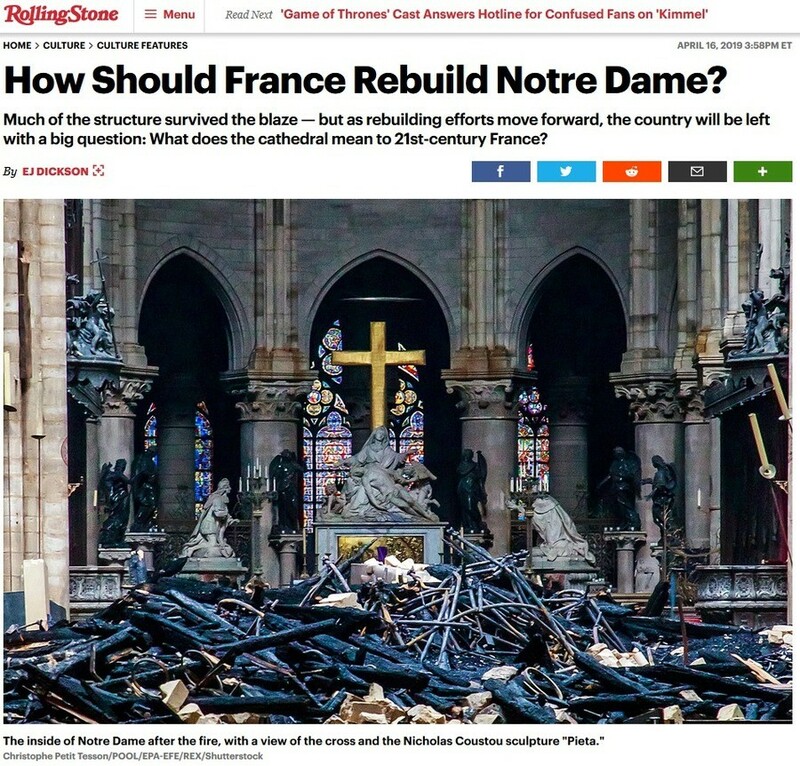 Any rebuilding should be a reflection not of an old France, or the France that never was — a non-secular, white European France — but a reflection of the France of today, a France that is currently in the making. “The idea that you can recreate the building is naive. It is to repeat past errors, category errors of thought, and one has to imagine that if anything is done to the building it has to be an expression of what we want — the Catholics of France, the French people — want. What is an expression of who we are now? What does it represent, who is it for?,” he says.